Fans of photography and of 20th century art have one last chance to view a spectacular exhibit at the National Gallery of Canada in Ottawa until Sunday, April 1st, 2012. Made in America 1900-1950 features some 130 photographs of American masters such as by Alfred Stieglitz, Edward Steichen, Clarence White, Paul Strand, Walker Evans, Margaret Bourke-White, Dorothea Lange, Berenice Abbott, Ansel Adams, Lisette Model, Weegee, and members of New York’s Photo League. The exhibit takes museum-goers through the two main tendencies in the development of photography during this period. On the one hand, there were those photographers who viewed the medium as another way to express images, shapes, forms and feelings. This is art for art’s sake, and in some of the photos displayed it is almost as if we are looking at black and white works by the impressionist painters themselves. The other trend displayed is the documentary approach. These photographers were highly skilled and their images are imbued with great use of forms and placement of the subject matter, but there is an underlying message, often one of social commentary. And so there are many photos showing the disadvantaged as well as ordinary working people, children, cities and the country. But as we are reminded looking at one of images featured in the exhibit, Ansel Adam’s Moonrise, Hernandez, New Mexico, the scenes presented to us on photographic paper are not necessarily free from manipulation even if the image is incredibly clear and detailed. 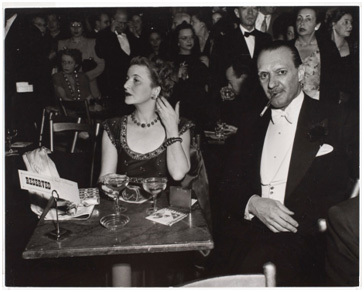 My personal favourite among the works on display is Arthur Leipzig’s photo Opening Night at the Opera, New York 1945, shown above. What a story one could write with this wonderful image as a starting point. Here we see what at first blush looks like a confident and arrogant couple. Not only do they have a seat unlike most of the lesser members of high society we see in the background, our featured couple has a table that is “reserved”. They must be important. But what else is going on here? Have the couple just had a spat? She appears to be looking away from the man, likely her husband. Has she turned her back on him, too? Maybe she is not pleased with the table they ended up with and has just finished blaming her husband for its location. “Our table is too close to those other people crowding in on us”, she might have said. “You should be happy we got a table at all”, he probably replied. Even if they had a spat, appearance must be kept up. The wife is checking her hair and making sure her expensive earring is not covered from view. Her chin is out, her head tilted slightly backward, and she has put on a look of disdain for all others around her. Her actions appear to be saying, “I am the elite of the elite.” Her husband stills seems annoyed following their likely argument, and it could not be worse timing for the photographer to snap this picture. “How dare you intrude on our table”, the man’s eyes tell us. But maybe our couple is not so self-confident as we thought at first. Could they be a little uncomfortable in their surroundings? Maybe madam’s hair touching is a sign of nerves. And note how although the gentleman is already smoking and has more than half his cigarette left in its holder, his cigarette case remains open on the table. It looks like he will be lighting up again soon. Champagne alone will not be enough to calm his jitters on this opening night. You owe it to yourself to see Made in America 1900-1950 and “listen” to the many stories told by each one of its photographs. The exhibit also includes a nice display of some famous cameras, including an original Leica. All in all, Ann Thomas, curator of the exhibit, has done a marvellous job putting this together. I do have a minor criticism. The small wall signs referencing each photograph are placed inconsistently, sometimes beside the right side of a photo, sometimes beside the left. This even occurs with photographs on the same wall of the exhibit. This arrangement does not make for a smooth visit to the exhibit, and museum goers do not know in which direction to walk, leading to numerous “head-on collisions”. Consistent positioning of these signs coupled with discreetly placed arrows on the walls would make for less confusion and more enjoyment, especially when large crowds are in attendance. It is unfortunate that the exhibit will end on April 1st. Casual museum goers are more likely to visit on long weekends, but this terrific exhibit will be gone from the National Gallery once Easter Weekend rolls around. If you cannot make it to Ottawa, Made in America will be presented at the Art Gallery of Windsor, Ontario, across the river from Detroit, MI, from 3 June to 3 September, 2012. For information on admission fees and how to get to the National Gallery of Canada, which has many other fine exhibits and works on display, go to www.gallery.ca. Image reproduced with permission. Copying is prohibited by law.